My wife's family is from southern Louisiana, and every summer we head down there for a family reunion. Being the techie in that extended Cajun family, I'm now the one who brings the music and public address systems. For the last few years I've paired a wireless microphone setup along with a smallish guitar amp, and it worked pretty well. When Aukey asked if I'd like to review a Bluetooth speaker that has a microphone, I said, "Yes, please." 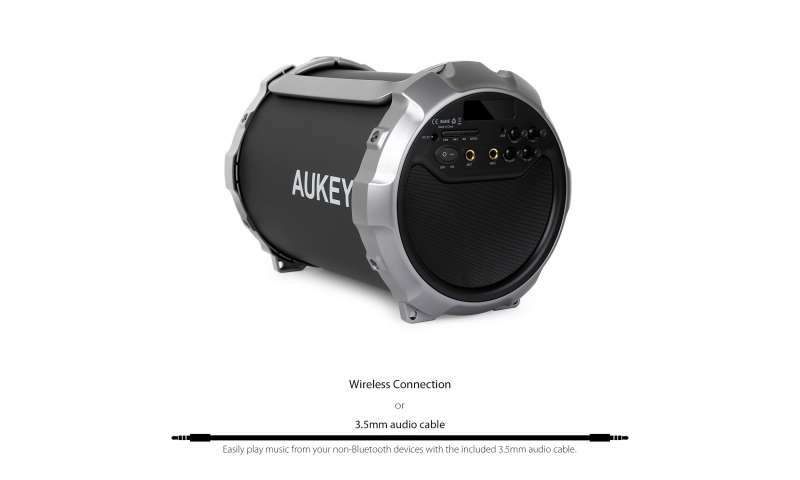 I've reviewed dozens of Bluetooth speakers, and after a while they all kind of look and sound the same, but the Aukey SK-M17 Portable Party Sound System is unlike any other I've tried. The SK-M17 ($79.99) is shaped like a small drum with speakers facing away from each other on the ends. The end with the controls houses two 3-watt drivers for midtones and highs, while the opposite end contains one large 15-watt subwoofer. In playing around with placement, I settled on putting the thing on its end with the subwoofer facing the floor. The SK-M17 can play music from a variety of sources. There's Bluetooth for streaming from a phone, tablet or computer, an aux-in jack for connecting MP3 players and any source with a headphone jack, and there's also an FM tuner for playing radio broadcasts. There are two quarter-inch microphone inputs so you can use the SK-M17 as a PA system or to sing along to your favorite tunes. Aukey includes one microphone in the box. There are a row of buttons controlling playback that work using Bluetooth. The FM radio is accessed via a mode button. The SK-M17's radio tuner will perform a scan and automatically save up to 25 stations, which you can scroll through by pressing the fast forward and rewind playback control buttons. The power plug is not universal, so you can't just bum a USB cable to power and charge it. The SK-M17 has a 5,200 mAh battery so you can use it for up to eight hours wherever you like. There are separate volume controls for the music and microphones. The music controls also include one knob for adjusting bass. Strangely, there's no control for treble. The microphone controls also include a knob for adjusting echo, which worked well. The power switch is an old-fashioned rocker switch, which was a nice touch. The SK-M17 also has a one-line digital display for showing the current radio frequency or input source. There are two handles that make it easy to tote the SK-M17 from place to place. The speaker is nicely constructed of plastic and metal, and the controls are intuitive to learn and use, but there is a small instruction booklet that covers it all. The SK-M17 is 9 inches in diameter and 12 inches tall and weighs 1.7 pounds. Unlike many other battery-powered Bluetooth speakers, the SK-M17 can't share its battery charge with other gadgets, nor can it be used to make phone calls. I don't miss either of those features, though. The Aukey SK-M17 is plenty loud, but the sound quality was average. The limited sound adjustments really take it out of contention as a serious sound system. It's classified pretty well as a party speaker. It's a great speaker to set in the corner of a room for background music at a party, and the included microphone is great for when the mood strikes for a sing-along. The battery makes it perfect for use out by the pool. Just keep it away from the water, as the SK-M17 is not splashproof at all. Your kids will love it, and it's priced right. This would be a great gift for the grandkids. Note: Aukey has a website for reading about its products, but it'll direct you to Amazon for purchases. Pros: Inexpensive. Compact, but big sound. Microphone is fun. Battery for outdoor use. Cons: The small size also lends to only average sound quality. Bottom line: Fun speaker system with several fun features that won't break the bank.